Well, at least two of those are true right now. It’s been rainy, gray, and mostly cold in Chicagoland the last few weeks, so one of the few fun things (ok besides some Netflix binging) has been diving into a bag of vegetable goodness. So now you now: rainy day = puttering around in the kitchen playing with food. The first farmshare delivery is always a bit of a surprise. As much as they try and give us an idea of what we’ll be getting, it all changes by the time they pick, pack, and deliver the bags. 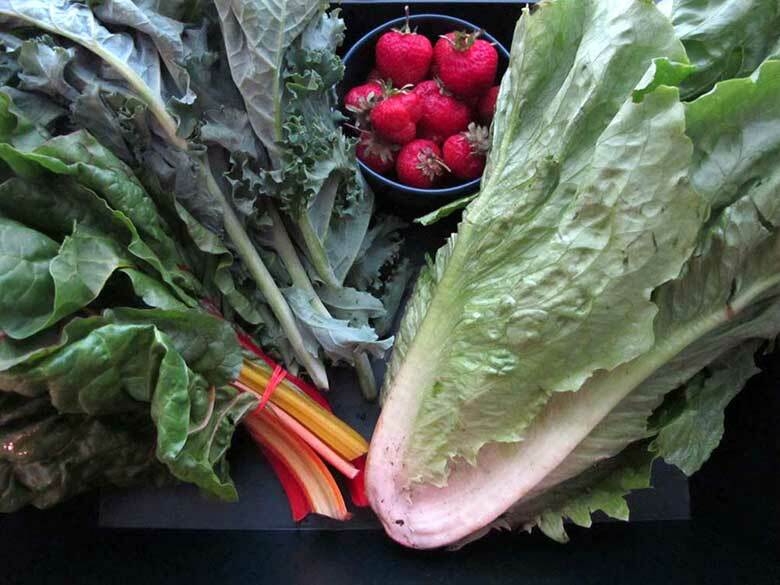 This week brought mostly greens: Swiss chard, kale, and Romaine lettuce plus two delicious bonuses: Strawberries and a thyme plant. The strawberries get eaten on their own or tossed with yogurt and granola. The lettuce is, not-surprisingly, pretty much all used up in salads. And the thyme plant, well, we’ll see if I can even keep that alive! Now, for those greens… This may surprise you (no it wont), but I’m the kind of nerd who gets a little bit excited about greens. 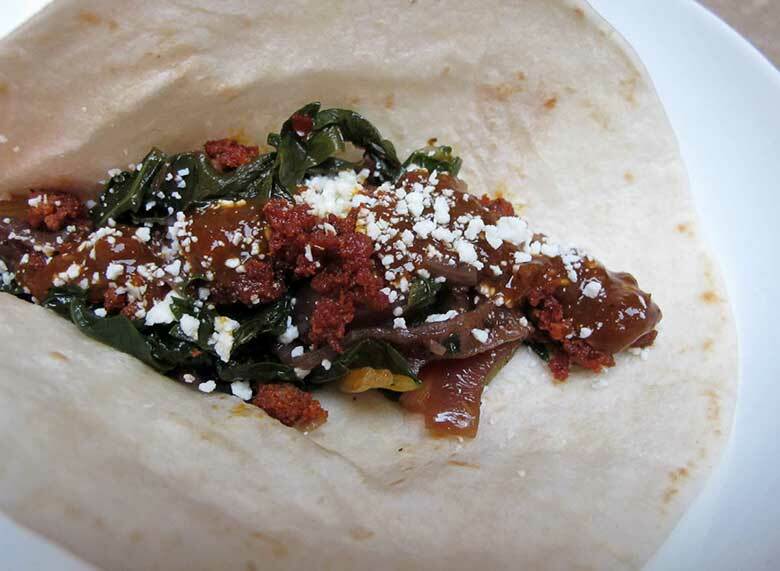 In this case, the minute Swiss chard shows up, I know exactly what I’ll make with it: Rick Bayless’s Swiss Chard and Caramelized Onion tacos from Mexican Everyday. Paired with a bit of crispy chorizo (and I do mean just a bit – it’s more garnish than main component), freshly made smoky salsa, and salty cheese, these are the perfect tacos for taking advantage of those voluminous greens. Seriously, greens are such fridge hogs, if you don’t take care to cook them quickly, they’ll pile up, plan an attack, and climb out of the fridge on their own. Just a note, these tacos aren’t your standard “Taco Tuesday” gut busters. They’re light tacos that are going to need a side to round them out to a full meal. Add some beans and/or rice and a crunchy radish and jicama salad and you’ll be set, though. Smoky, delicious tacos that will use up those greens overtaking your crisper drawer! In a large, 12-inch skillet, cook the chorizo over medium heat until crumbly and browned. Set aside; Reserving any remaining fat in the pan. While the chorizo is cooking, cut the greens lengthwise, trimming out the thicker part of the stems, then crosswise in 1/4-inch slices. You can use the Swiss chard stems, if you like, just slice them thinly. Add 1 to 1-1/2 tablespoons of oil to the pan to heat. Add the onion and sliced stems (if using) and cook 4 to 5 minutes, stirring frequently, until browned but still crunchy. Add the garlic and chile flakes, stir for a few seconds until aromatic, then add the broth or water, ½ teaspoon salt and the greens. Reduce the heat to medium-low, cover the pan. Cook until the greens are almost tender. About 5 minutes for chard and 7 – 8 minutes for thicker greens. If you’re using a mix of greens and are concerned about overcooking, add the thicker greens first and the chard a few minutes later. Toss the greens every few minutes to encourage a good coating of oil and seasonings. When the greens are almost fully cooked, uncover the pan, raise the temperature to medium-high and cook, stirring continually, until the mixture is nearly dry. Taste and season with additional salt if you think necessary. Serve with warm tortillas, cooked chorizo, salsa and crumbled cheese. *Some of you lucky ducks live in climates where you can get year round, or much earlier, farmshare deliveries, please be nice to those of us who, sadly, have to wait until June!